The MacPherson family's Simmental bull, shown by Garry Patterson, was champion of champions at Nairn Show. 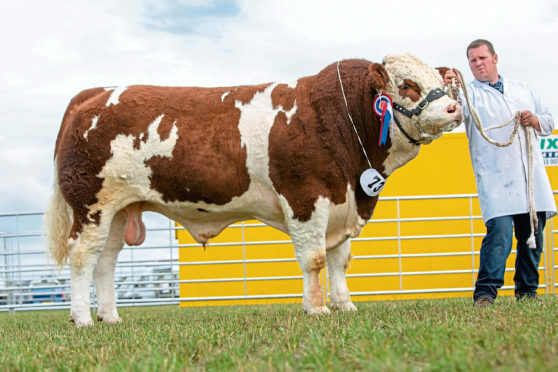 A Simmental bull from the MacPherson family’s Blackford herd at Croy, near Inverness, scooped the champion of champions accolade at Nairn Show on Saturday, where the weather was kinder than anticipated. Lifting a fifth beef supreme title and a second show champion of champions award for father and daughter team Billy and Anne, was Blackford Iolair, a 16-month-old son of the 18,000gn Kilbride Doubleaction tapped out by show president, Peter Forbes’ guests and retired Nairnshire farmers George and Elizabeth McConnachie. 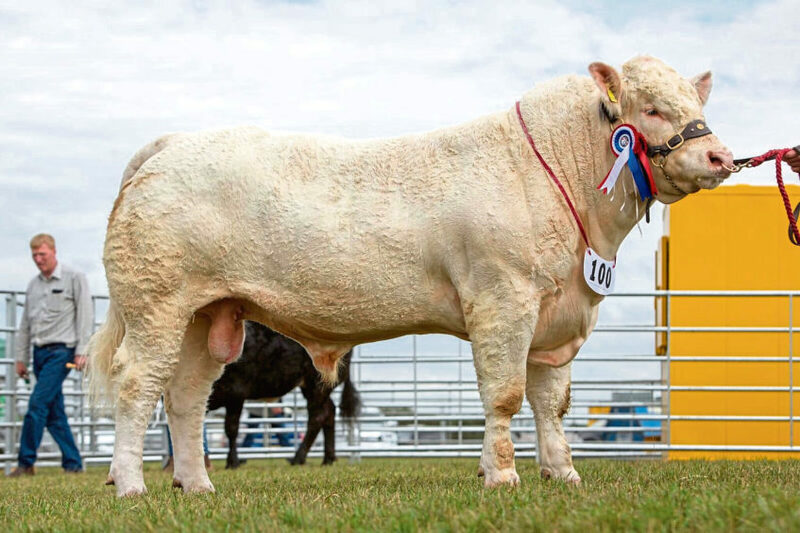 Shown by Garry Patterson, he is out of the Kilbride Farm Strabane-sired Blackford Waxwing and was on his first outing since the Highland Show where he stood first in his class and won the continental Beefbreeder championship. Beef interbreed judge Stuart Wood, from Garson Farm, Sandwick, Orkney, said Iolair was “easy on the eye”. Also forward for the top title was the supreme sheep champion, a home-bred Texel gimmer from Allan Chisholm’s Wester Moy flock at Urray, Muir of Ord. Brought out by David Coli was a daughter of the 32,000gn Arkle Yingyang, bred out of a 60,000gn Teiglum Tornato ewe. She stood champion at Sutherland. 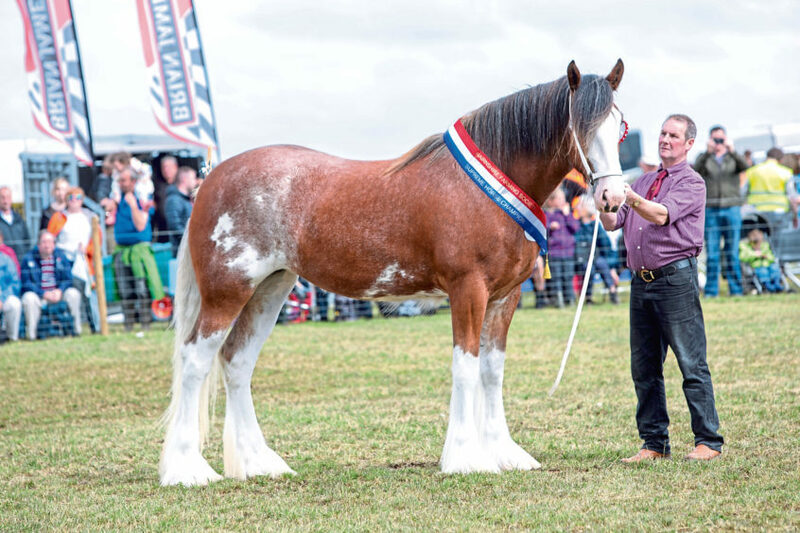 The multiple show winning Clydesdale filly – Ord Tinkberbell from Eric and Miranda Johnstone, Muir of Ord – was back among the tickets as overall horse champion. Standing reserve overall in the beef section was the leader from the Charolais section – a January 2017-born bull named Anside Nightrider, by Woodpark Elgin, from the Irvine family at Braehead, Drummuir, Keith. Back in the sheep rings, the reserve interbreed championship was won by first-time exhibitor, six-year-old Kyle Darvill from Burn Banks Crofts, Linside, Invershin, with a Poll Dorset tup lamb. Highland Cattle – Tordarroch, Farr, Inverness, with Heather 12 of Tordarroch, a two-year-old heifer which stood champion at Sutherland, last week. She is by Hamish of Knockendon. Reserve – Allanfearn Highlanders, New House, Heights of Inchvannie, Strathpeffer, with the three-year-old heifer Saphire of Allanfearn by Eilean Dubh of Craigowmill. Aberdeen Angus – David Walker, Galcantray, Cawdor, with Galcantray Pam, a three-year-old cow by Blelack Jupiter Eric. Reserve – The Rhind family, Newton of Struthers, Kinloss, Forres, with Newton Struthers Evo, a two-year-old bull by Retnick Panzer. Beef Shorthorn – Andrew Anderson, Smallburn Farms, Elgin, with the six-year-old cow, Shawhill Fancy by Alvie Blue Eyedboy.Reserve – Glenrinnes Farms, Dufftown, Keith, with Glenrinnes Loopylou, a 17-month-old heifer by Chapelton Glenlivet. Limousin – Stephen Irvine, Braehead, Drummuir, Keith, with Anside Nigel, a 15-month-old son of Lodge Hamlet. He was junior male at the Limousin Grand Prix at Echt. Reserve – Michael Robertson, Fodderletter Farms, Tomintoul, with Moonleaze Norbert, a 16-month-old bull by Losebrae Ben. Simmental – The MacPherson family, Blackford, Croy, with 16-month-old bull Blackford Iolair, by Kilbride Farm Doubleaction. He was Beef Breeder champion at the Highland. Reserve – The Green family, Corskie, Garmouth, with Corskie Herb, a 22-month-old son of the 45,000gn Bel Dhu Capercaillie. The Charolais and reserve beef interbreed champion was a bull named Anside Nightrider. Charolais – Stephen Irvine, Braehead, Drummuir, with Anside Nightrider, an 18-month-old bull by Woodpark Elgin, out of Anside Geisha. Reserve – Billy and Gary Wright, Lagavaich, Glenlivet, with Lagavaich Lucy, a three-year-old female by Inverlochy Ferdy. She was with her February-born bull calf Lagavaich Olly. YF North Show Circuit – Georgia Fraser, Little Croy, Inverness, with a 14-month-old Limousin cross heifer which stood overall reserve YF champion at Sutherland. Reserve – Kyle Cruikshank, Clury Farm, Dulnain Bridge, Grantown, with Clury Nexus, a home-bred 14-month-old Limousin bull by Foxhillfarm Impecabull. Commercial cattle – Mark Munro, Invercharron, Ardgay, with a home-bred January-born Limousin cross heifer, by Plumtree Fallon, named She Who Dares. Reserve – Donald Morrison, Burnside, Kinlochbervie, Sutherland, with Pepsi, a 15-month-old Limousin cross heifer bred by the Robertsons of Newton of Logierait. Bought at the Spring Show. Any other pure bred – Sarah Balfour, Fodderletter Farms, Tomintoul, with British Blues. Blackface – Glenrinnes Farms, Dufftown, Keith, with a shearling tup, by a Whelphill, bought at Lanark for £1,100 from Hartside. Reserve – Robert Flett, Blackpark Croft, The Heights, Docharty, with a one-crop ewe bred by Gass. Suffolk – Louise Mcauley, 3 Easter Coxton, Elgin, with the shearling tup Bareflathills Big Impression bought privately last summer. By Cairnorrie Hello Santos, he is out of a Bareflathills ewe and stood champion at Sutherland and reserve at Echt. Reserve – Louise Mcauley with a home-bred tup lamb by Lindim Eye Catcher, out of an Essie ewe. The sheep interbreed champion was Allan Chisholm’s Texel gimmer. Texel – Allan Chisholm, Wester Moy, Urray, Muir of Ord, with a home-bred gimmer by the 32,000gn Arkle Yingyang, out of a Teiglum Tornado ewe. 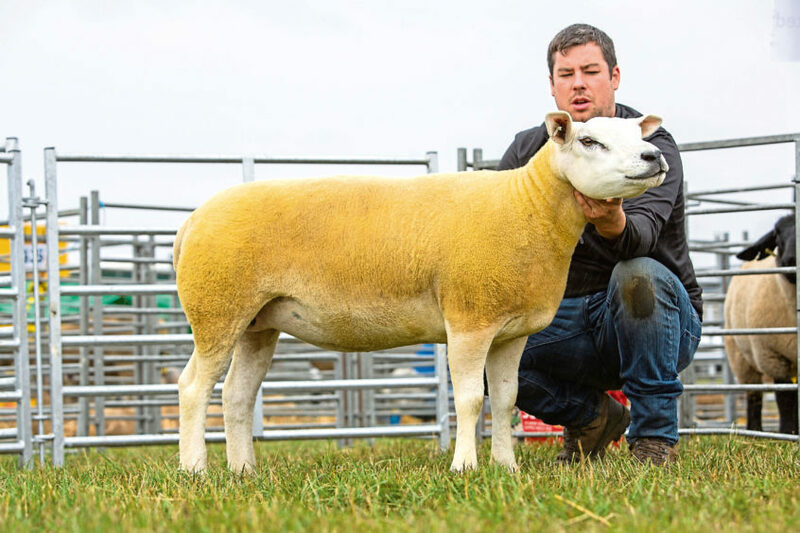 She was champion at Sutherland.Reserve – Keith Ingram, 2 Balloch View, Banffshire, with a two-crop ewe by Arman Vyrnwy. Bluefaced Leicester – Raymond Baynes, Blackford, Croy, with a home-bred gimmer by Cassington D1, out of dam which bred last year’s champion here. Reserve – Raymond Baynes with a home-bred two-crop ewe by a Rossiebank tup. Beltex – Zoey Rennie, 4 South St, Newmill, Keith, with Mats Bullshot, a two-shear tup bought two years ago at Carlisle. He is by Kingledores Apollo and stood champion at New Deer. Reserve – Donald Douglas, Braes of Coulmore, North Kessock, Inverness, with Fingle Gobra, a shearling tup bought last year at Carlisle. Sired by Kingledores Alfred. Zwartbles – The Bissett family, Mariain, Culnaskeath, Evanton, with the home-bred gimmer Carrah Eclaire, by Donbride Big D. She stood reserve supreme at the Black Isle last year. Reserve – K and W Anderson, Cairnhill, Farr, Inverness, with a home-bred ewe lamb by Carrah Diesel. She was reserve champion at Sutherland. Jacob – Adam Christie, Birchfield, Glass, Huntly, with Hope Knockout, a two-shear tup by Hyndshaw Highland Laddie. Reserve – Moira Milton, Newton of Auchindahcy, Keith, with Cairdswood Millie, a four-crop ewe by Burnside Everyl. Cross-bred sheep – Gavin Breathet, Woodside Croft, Blackpark, Ardersier, with three March-born Texel cross Suffolk breeding ewe lambs by a Wester Moy tup. Reserve – Gavin Breathet, with three Texel cross Suffolk prime ewe lambs. Mules – D and DM Leslie, Redhill Farm, Mosstowie, Elgin, with a pen of gimmers. Reserve – K and S Matheson, Milton of Aberdarder, Strathnairn, Inverness, with three ewe lambs. Any other breed acc – Yvonne Spence, Gowan Brae, Skye of Curr, Dulnain, with Rolls Royce, a two-shear Charollais tup bought as a shearling at Worcester. Reserve – Yvonne Spence with a home-bred Charollais gimmer. Any other breed non-acc – Kyle Darvill, Burn Banks Crofts, Linside, Invershin, with a Poll Dorset tup lamb bought as a young lamb which was reared by one of Kyle’s ewes. This was Kyle’s first ever show outing with sheep. Reserve – Erin and Donald Grant, Druid Temple Farm, Inverness, with a Valais Blacknose ewe lamb named Foxglove. Clydesdales – Eric and Miranda Johnstone, 50 Highfield Circle, Muir of Ord, with two-year-old filly Ord Tinkerbell, by Eskechraggan Ernest. Reserve – David Walker and Beverley Brown, Galcantray, Cawdor, with Kilmaclasser Bonnie Lily, a five-year-old brood mare. Ord Tinkerbell was horse interbreed champion. Highland pony – Shona Halford, Muirside Steading, Brodie, Forres, with home-bred yeld mare Gaolean of Croila. Reserve – Sally Leslie-Melville, Croy, with three-year-old filly Glenbanchor Lismore’s. Shetland – Harry Sleigh, St John Wells, Fyvie, with the three-year-old colt Wells Craig by Wells Misfit. Reserve – Caroline Window, Carrisgil Shetlands, Caithness, with eight-year-old mare Orkney’s Sugar Candy.